* POWERMAN 5000 AND MORE SCHEDULED TO PERFORM! Orlando, Fla. – November 10, 2017 – 101one WJRR, Orlando’s Rock Station, announced today its Earthday Birthday 25 music festival, taking place on Saturday, April 21 at the Central Florida Fairgrounds. 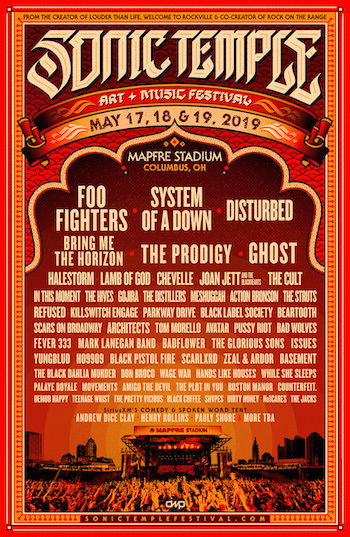 This year’s music festival includes performances from Shinedown, Three Days Grace, Seether, Starset, Fozzy, 10 Years, Powerman 5000 and more. It also marks the 25th anniversary of the locally-produced show. Earthday Birthday is one of the largest annual rock festivals in the state and draws upwards of 15,000 music lovers from around the globe. A special pre-sale for WJRR Club 101 Members and Earthday Birthday Facebook fans will go on sale Friday, November 10 at 10 AM and will run through Sunday, November 12 at midnight. EDBD 25’s Club 101 member pre-sale tickets are $25 and will be limited. General admission tickets will go on sale at 10 AM on Monday, November 13. A limited number of EDBD 25 VIP tickets will be available during the general sale and will include special viewing areas, private bathrooms, lunch, dinner, free soda, water and more. Pre-sale, general admission and VIP tickets are available at all Ticketmaster outlets and online at www.wjrr.com and www.ticketmaster.com. For the latest info on 101one WJRR’s Earthday Birthday 25, log on to www.wjrr.com keyword: EDBD, or listen to 101one WJRR on-air or online via the station’s website, as well as on iHeartRadio, iHeartMedia’s free all-in-one digital radio service. 101one WJRR is the leading media outlet in the Orlando market with multiple platforms, including its broadcast station; live events; data; and its digital businesses and platforms, including mobile, social and its own iHeartRadio, the leading all-in-one streaming music and live radio service – with more than 1.4 billion app downloads and 100 million registered users. iHeartMedia Orlando owns and operates WMGF-FM. WXXL-FM, WRUM-FM, WJRR-FM, WTKS-FM, WFLF-AM, WYGM-AM, WTKS-HD, WMGF-HD, WRUM2-HD, WXXL-HD and is part of iHeartMedia. With over a quarter of a billion monthly listeners in the U.S. and over 122 million social followers, iHeartMedia has the largest national reach of any radio or television outlet in America. As the leader in multiplatform connections, it also serves over 150 local markets through 858 owned radio stations, and the company’s radio stations and content can be heard on AM/FM, HD digital radio, satellite radio, on the Internet at iHeartRadio.com and on the company’s radio station websites, on the iHeartRadio mobile app, in enhanced auto dashes, on tablets, wearables and smartphones, and on gaming consoles.